Students who wish to simply enjoy the basics of Irish dance should consider our Recreational Division. This program is ideal for beginners, those new to Irish dance, and for students who are involved in other activities. The Recreational Division Season extends from September – May (9 months) with optional summer classes for Folklorama in June and July. General Division dancers learn both traditional and modern styles of Irish dance. General dancers have the option to take one class per week or attend multiple lessons (we recommend a competitive class as a 2nd option for improving technique). General Division Students perform at our St. Patrick’s Fest, Year End Recital, and at Folklorama. Which Level Is the Best For You? Recreational levels are based on dancer's ages and in most cases the best choice for students is to enrol in the class within their age category. There are always exceptions and our aim is to find the best class for dancers to learn and progress with Irish dance, regardless of age or experience. For dancer's who are starting at an older age than our typical Beginner (Ages 3 - 6) there are options to insure they are able to keep up with dancer's who've already had previous Irish dance experience. The best option for new Irish dancers to quickly pick up on the basics of Irish dance is to take a few private lessons with our instructors. A Competitive Bunghrád - Level 1 class is an option for dancers wishing to speed up the process of learning the basics. Competitive classes may be attended on drop-in basis. Teacher's assistants are always available to work with new students during class time to help bring them up to speed on the basics. For dancer's who register for a level and find it's not the right fit for them, there is always the option to try another level or Division to find the most appropriate class. This level may be appropriate for students 2 1/2 if they are capable of participating in the class without an accompanying parent without assistance from their parents. 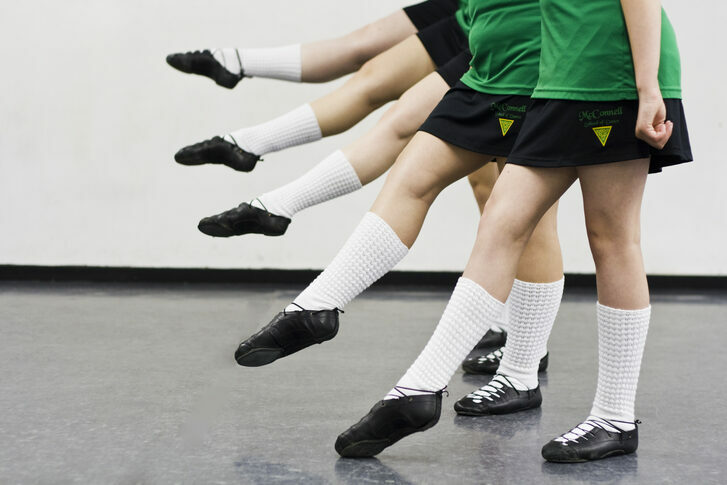 Beginner students learn the basics of soft-shoe Irish dancing starting with the Beginner (Bunghrád - Level 1) Reel and progress to the Light Jig (3 steps). Once the Reel & Light Jig are mastered, Beginner dancers will learn the Bunghrád Single Jig and Slip Jig. Student's also learn an Irish children's song and dance. Warm up, stretching and technique is included in the lesson. Focus is on developing soft shoe technique and progressing towards hard shoe work. Novice Level students learn Irish soft-shoe steps the Bunghrád - Level 1 & Ullmhuchán or Level 2 Reel, Bunghrád Light Jig (5 Steps), Single Jig, and Slip Jig. Novice dancers also learn their first Ceili dance (group dance with figures). Novice dancers begin hard shoe training which extends through one half the lesson and learn the Ullmhuchán Hornpipe. Warm up and technique is included in the class. Preliminary Level students learn Irish soft-shoe steps with the Ullmhuchán - Level 2 Reel, Single Jig, and Slip Jig. Preliminary dancers learn a Ceili dance (group dance with figures and choreography). 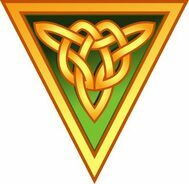 Preliminary dancers continue hard shoe training, extending through one half the lesson and learn an Ullmhuchán Hornpipe, Heavy Jig, and a Traditional Set Dance. Warm up and technique is included in the class. Intermediate Level students continue with more difficult soft-shoe work in the Meanghràd - Level 2 Reel, Single Jig, and Slip Jig. Intermediate dancers learn a Ceili dance (group dance with figures and choreography). Intermediate dancers continue hard shoe training, extending through one half the lesson and learn the Meanghrád Hornpipe, Heavy Jig, Treble Reel and Traditional Set Dance. Warm up and technique is included in the class. Advanced Level students continue with more difficult soft-shoe work in the Meanghràd - Level 2 Reel & Ardghrád Level 4 Reel, Single Jig, and Slip Jig. Advanced dancers learn a Ceili dance (group dance with figures and choreography). Advanced dancers continue hard shoe training, extending through one half the lesson and learn the Ardghrád Hornpipe, Heavy Jig, Traditional or Contemporary Set Dance, or Treble Reel. Warm up and technique is included in the class. Adult classes range in level from Beginner to Intermediate and are suitable for dancers with no previous dance experience or some dance in their background. Dancers who've had substantial amounts of dance in their background may want to consider a Competitive Class or our Advanced Level Recreational Class. Adult dancers have the opportunity to learn Bunghrád Level 1 - Ardghrád Level 4 dances. Adult students learn both soft shoe and hard shoe in the class. Dancers also learn a Ceili (group dance wih figures). Warm up and technique is included in the class. Studio is open 15 minutes prior to classes to allow dancers to get changed for class. Please try to arrive on time and don't miss the warm-up as it's important for technique & injury prevention. Parking is available in the 4 spots in front of the studio and on the street. Please avoid parking in the spots designated for other businesses in the lot. The waiting room is available for parents who wish to stay for the duration of their dancer's class. Space is limited so please allow space for other's. Please keep the waiting room a positive environment and avoid discussions which may be considered negative, controversial or upsetting to a healthy learning environment for our dancers. Only dancers allowed in the change rooms, for privacy reasons. Please do not enter the studio once classes have began. Dancers, please knock if you are late for class. Parents, please do not enter the studio, at anytime unless invited. Viewing windows are located in our Winnipeg Studios A & B. Please limit time at the viewing window so you do not distract your dancer from learning. If your child is being distracted by your viewing instructors may ask you to avoid the window or the blind will be closed. Classes 1.5 hrs. and longer will receive a 5 minute break during their lesson. Dancers are welcome to bring snacks from home. Please try to avoid snacks with peanuts. Dancers are to remain in the rehearsal studio unless excused by the class instructor. Parents, friends, and family members are not allowed in the dance studio. Dancers are to be dressed in appropriate dance attire. Please see dress code below. Only dance shoes, dance bags, purses / wallets, and water bottles may be brought into the studio (no food or outerwear). Please bring all necessary items in to class with you at the beginning of class. Do not leave valuables in the change room. Our studio is located close to major shopping centres. Parents may leave the studio once children have begun their lesson. Parents who's children are unable to use the restroom themselves should remain at the studio. Please to arrive on time for pick-up. Additional charges may apply for dancers who delay instructors departure time. Respectful, positive attitude towards instructors and fellow dancers must be demonstrated by dancers and their parents at all times. Dancers or parents who exhibit negative behaviour towards instructors, other students, or parents will be asked to leave the school. Instructors are not available to meet with dancers or parents during class hours. Please do not disturb instructors during class time & be aware your instructor may have another class to teach after yours. Serious issues should be dealt with immediately after the class. McConnell School of Dance Student's Association sponsors the United Kingdom Pavilion Folklorama (RBC Convention Centre) and McConnell dancers perform Irish, Welsh, and English styles of dance in the show. Our instructors, parents, and family members volunteer their time to organize and run the various areas of the pavilion (administrative, show, bar, kitchen, cultural area, admissions, and volunteers). Recreational Division dancers wishing to perform at Folklorama take classes during the months of June & July (Tuesday evenings) and attend monthly workshops throughout the dance season. Dancers perform only their most practice dances at Folklorama as the standard is very high. Folklorama is a great experience for dancers who don't often have the opportunity to take part in a professional with live music. It's a great team building time for dancers who build life long friendships and we invite all Recreational Division dancers to take part in the festival. Performances include both traditional and modern style Irish dances and choreography is planned at the beginning of the season. Dancer's who do not wish to perform should inform us at the beginning of the season. Student's will be asked to confirm their participation for performances by December. Traditional Ceili dances and choreographed routines have a set number of dancers required for each dance and therefore it is important dancers confirm their commitment for the season's performances by December each season. If you commit to a performance please do your best to attend. Class time is dedicated to rehearsals and the other students and instructors are counting on your participation. Last minute cancellations upset the routines and make it difficult for everyone in the class. Students who do not know their dances, frequently miss classes, or who fall behind on their steps may not perform all routines with their current level. Dancers who are behind their current level should consider private lessons to assist them in catching up with their class. Performance information (location, arrival & performance times, etc.) is sent out via e-mail approximately 1 week prior to all major performances. Try to arrive on time for performances and allow for traffic and parking delays. If you are running late, please do not speed and risk an accident. We would rather you arrive late than injured or not at all. Always arrive with your wig on, socks & tights on, and make-up applied. Parents are not allowed in dressing rooms at any performance, unless they are designated as dressing room volunteers. Parents should not ask to speak with Instructors at a performance as their attention must be focused on the dancer’s performance. For school performances, all dancers will need to be checked in and out of dressing room. Dancers under 12 will require a parent or guardian for check out. Applying make-up and changing costumes in public washrooms should be avoided, if possible. Be respectful of limited amounts of space in dressing rooms, especially when sharing with other performing groups. Leave dressing rooms clean after using them. Please take garbage home with you, if refuse containers are not provided. Please remember that while wearing your McConnell School of Dance attire, or costume, you are representing the entire school and appropriate and polite behaviour is expected at all times. All dancers should have the required footwear for their registered level by the end of September each season. 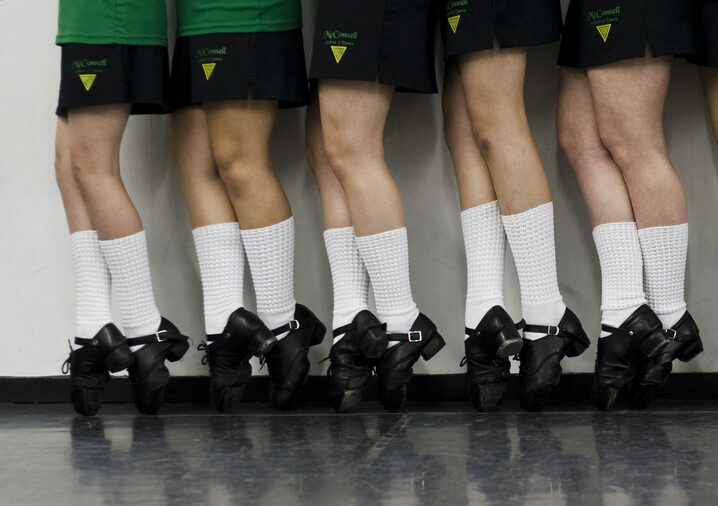 We strongly recommend beginner students wait a few classes before they purchase Irish dance shoes in order to ascertain whether or not they intend to continue with lessons. New students may wear socks, well fitting slippers or ballet slippers for the first few weeks of classes. Boys wear Boys Reel Shoes. Boys begin with soft heels (Capezio Jazz shoes) and progress to Reel Shoes with Hard Shoe Heel pieces. Your instructor will inform you when it’s time to advance to Reel Shoes with heel pieces. 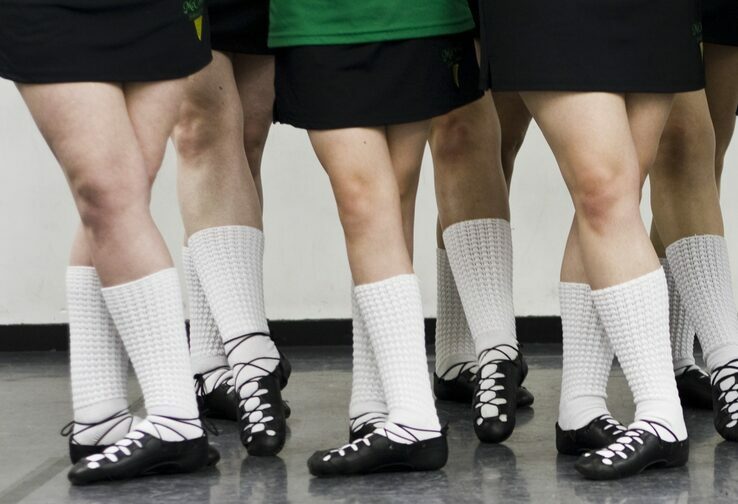 Both Females and Males wear Irish Dance Hard Shoes. School costumes are required for all dancers wishing to perform. Costumes are ordered in November each season. 2nd hand costumes can be purchased at our costume swap at the end of September. General Division School costumes range in price from $125 - $350, depending on the dancers level and age. Second hand costumes and shoes may be listed on the bulletin board at the studio. MSDSA - McConnell School of Dance Student’s Association hosts an annual costume swap to assist dancers who wish to sell or purchase Irish dance shoes, costumes, and accessories. A large selection of 2nd hand costumes, shoes, and dance supplies are available for sale. When are costume fees due? Costume fees are due prior to pick up of costumes. Can I rent a school costume if I do not wish to purchase? A limited number of rental costumes are available. Sizing is limited so please contact us early in the season to reserve. If a dancer advances levels, do they require a new class costume? Yes, dancers who progress to higher levels will need a new class costume for their new level. How long will a class costume be used? Class costumes are changed every 4- 7 years to keep the designs current. Most dancers grow out of their class costumes and are able to sell their old dress to up & coming students to help offset the cost of a new costume. White Poodle Socks - Available at the studio $12 each, order on line from Irish dance supply stores, or pick up at Unique Ireland on Pembina Hwy. Female - New Black & Green Dress, Poodle Socks, Black Spankies / Dance Briefs. Females - Black Sleeveless Dress, Poodle Socks, Black Spankies / Dance Briefs. Advanced level dancers also have the option to purchase a solo dress. All solo dresses must be approved by your teacher, prior to purchase or order. Black Spankies / Dance Briefs - A necessary item for all dancers. Purchase by the dancer from dance supply or retail outlet. Black Spankies / Dance Briefs - A necessary item for all dancers. Purchase by the parent from dance supply or retail outlet. Females - Green & Orange Dress, Poodle Socks, Black Spankies / Dance Briefs. Irish dance wigs are optional for all Recreational Division Students. Many of our dancers prefer to wear Irish dance wigs for the convenience and to keep with the current styles. Wigs are available in many different styles and shades. We recommend dancers choose a shade as close to their own as possible.